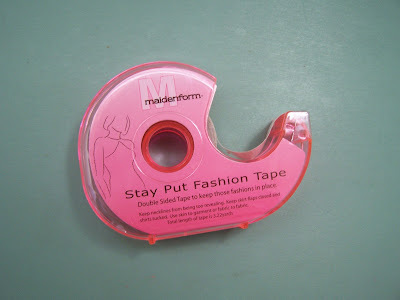 This is a double sided tape created to keep your clothes in place. As you know if you have followed me a bit, I read a lot of fashion books & magazines. One thing that I have learned is that even the famous have these problems. When they arrive on the red carpet there is a bevy of tricks, & products they use to arrive in such perfection. I have used stay put fashion tape for about a year or so & I love it. It has not harmed any of my clothes. It will stick fabric to skin or fabric to fabric and I can remove it easily when I want to. It really does give me confidence that I won't be flashing anything. If you need some confidence in this area then you might give this a try. You can find this product when you click on the name above or I have seen it at several of the fine department stores. I've used something similar to this and I love it. I happen to be an A-cup (boo-hoo) so I have a hard time finding tops that fit right (suggestions?). I love the tape that sticks those v-necks right to my chest. The clothes stay put and no one knows! As you know, I LOVE your blog and more than that, i think you are an amazing woman of God. Thank you for being a friend. Hi Debbie, this is such an fun blog!! Great tips..... I will be back for more! Thank you for stopping by and adding yourself to my followers.... I hope you enjoy your visits. hola! I am curious baou that infomercial product where it lifts your bra up. Thanks for the tip on the tape.